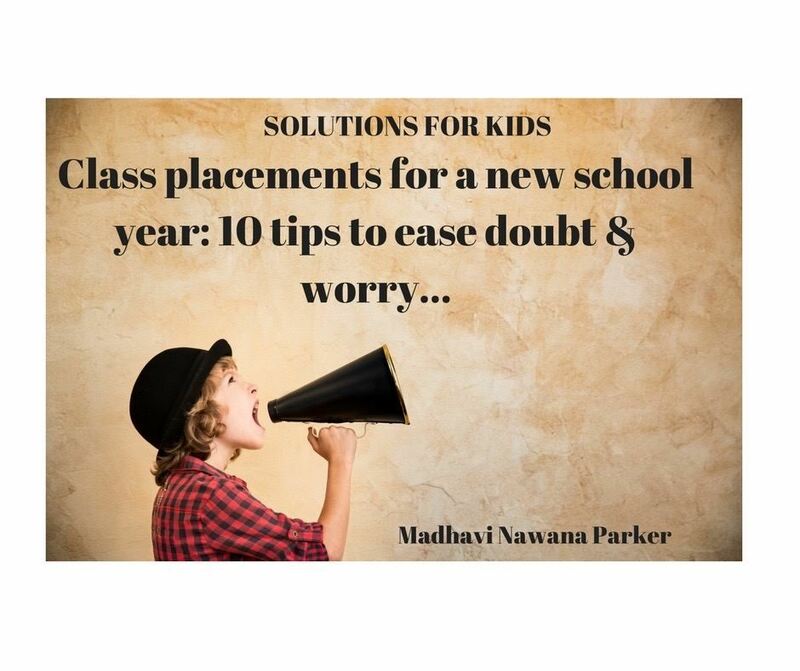 A timely post from Madhavi Nawana Parker. For more information on guiding young people to be happier and more resilient please follow SOLUTIONS FOR KIDS on Facebook. Children and parents are currently finding out about teachers and classmates for 2018 around Australia. The new and unknown has unsettled people since the beginning of time. If humans were capable of having no doubt and being pumped with excitement for all the new and different experiences, we’d have a disproportionate amount of people taking a lot of incalculable risks! You need to experience doubt and uncertainty occasionally – especially when bigger things change or you’re faced with new experiences. These natural nerves keep us focused, responsible and thinking about who we are, what we want, what is worth giving a go and what might need to wait. If adults show overwhelming concern about these doubts in children, (or distract them from thinking about the situation they are uncertain about), things can escalate and lose perspective fast. Here are 10 ways you can respond if your child is not happy about who is in their class, the friends they have been separated from and who will be teaching them. Emotions spread fast. When your child is anxious, you’ll probably feel anxious too and vice versa. Stay as calm as possible and share your concerns with trusted adults. If children get a hint you’re worried, they’ll hop on the worry bus with you. This doesn’t mean you act like you don’t care, or indicate there’s no reason for your child to care. It’s about not getting frightened with them! Let them have their feelings and concerns. With kindness, acknowledge their uncertainty. You can simply say, ‘I know the thought of next year feels scary right now – I understand.’ If you talk too much they might think it’s so serious it needs a lot of discussion. By listening, saying little and acknowledging their feelings you’re letting them know they are safe and you trust they have the skills to cope. You’re also letting them know a degree of doubt is natural when you’re entering the unknown. That doesn’t mean you need to be saved from that feeling. Try to avoid fixing their pain. When you’re there for them by listening, loving, caring and acknowledging their thoughts and feelings, they are in the perfect space to find their own solutions to their problems. They will also grow courage from this to handle doubt. Pain and uncertainty is part of life. Children need practice coping with these feelings to prepare them for life. Focus on the positives (not all at once – that’s a dead give away you are just as worried as they are!) Talk about the new students in their class and what you like about them, things you’ve seen the new teacher do that you admired and so on. People naturally focus on negatives and need help sometimes to keep perspective. Encourage them to be grateful. Help them list all the things they’re grateful for about their new class or school. Gratitude practice is well researched to help shift us into optimism and to help keep life in perspective. Use their anxiety as an opportunity to teach coping skills. If they are talking a lot about it, ask questions like, ‘how can you handle that feeling if that does happen?’ Teaching your children breathing techniques, how to talk about feelings and when to ask for help are all great whether your child is struggling with big feelings or not. Remind your child this is THEIR experience with the teacher and students in their class. Each school year and mix of students is different. When they are worried about rumours they’ve heard in the yard about their teacher and other students…help them understand this is how OTHER people felt. That’s THEIR opinion. Your child’s experience will be unique to them based on their personality, temperament and skills. Make sure it’s not keeping them up at night. Sleep deprivation makes anxiety much worse so help them learn to fall back to sleep and follow the golden rule of worries out of the bedroom. (see my earlier post on sleep for some tips). Help them keep it all in perspective. Schools are a great place to practice mixing with a variety of personalities. Life relies on flexibility and the ability to adapt to different people and circumstances. When your child is in a class with a child they don’t get along well with, this provides an opportunity for them to develop skills in adapting to differences. As long as this child is not bullying them or causing them psychological stress, these differences can be very important in developing emotional resilience and learning to accept different personalities. This also includes teachers. If your child is not jumping for joy about their new teacher – this is a great way to get used to a ‘boss’ they’re not fond of! You don’t have to like your teacher to learn from them! (Although liking your teacher and knowing your teacher likes you back does help!) While being separated from friends is tough and your empathy is certainly needed here – usually, they’ll be okay. It gets them out of their comfort zone to meet new friends. This builds confidence and resilience. Last of all, show your confidence in your child’s ability to handle anything that comes their way. Assure them there will always be people there to listen and cheer them on. Maintain the message that life can throw in challenges but they’re smart enough and tough enough to handle them! As always, follow your instincts. If there are significant things you’re concerned about, most schools are happy to work through them to find a solution. Have faith in yourself to support your child to face their challenges and faith in their school to support you through them. Most of the time, the worries and doubt experienced at the time of these announcements don’t turn into anything ugly, they’re just part of the adjustment stage.